Hi Folks, here's my writeup to conclude yesterdays post on crosscompiling arm6v packages for the Raspberry Pi. Today I'm gonna quickly explain how to expose the packages repository via http from your build server. So to summarize from my previous writeup, poudriere was used to crosscompile packages for armv6 platform. I used an x86 based build server to achieve this. Once this completes, poudriere will automatically generate a package repository. The location for the repository will be set from the poudriere.conf's POUDRIERE_DATA config option, which will be /build/poudriere/data/in this example. Poudriere will automatically create a subdirectory called packages. The repository will be created in a subdirectory derived from the jail and the ports tree used, here arm102-ports_10_2_armv6. Let's have a quick look at this. Here's just to the top-level of the package repository. Poudriere will maintain a set of distinct release directories in there, designated by the .real_timestamp name. Also important to note is that there is a symlink called .latest which links to the latest release. So in the end, /build/poudriere/data/packages/arm102-ports_10_2_armv6/.latest directory is the one which we will be serving up from a web-server. drwxr-xr-x 4 root wheel 10 Aug 31 22:16 .
drwxr-xr-x 3 root wheel 3 Aug 31 22:01 .. Choosing a web-server is always a little of a debate. If you have python available, you can quickly and easily serve up files via http, also Apache and nginx are good choices. I tend to use lighttpd for simple things, as it still sports everything a web-servers needs to have, while not beeing like a bloated monster as it's easy to setup and get going in under five minutes. Then add the line lighttpd_enable="YES" to /etc/rc.conf. But before you actually start lighttpd, open up /usr/local/etc/lighttpd/modules.conf in your editor of choice. Uncomment the mod_alias keyword, then save the change and exit. Now create the default document root and set default permissions. If all went well, you should be able to call up your web-server on the http://IP-ADDRESS/FreeBSD:10:armv6 URL. The URL may look strange but that's exactly what you need. It's the ABI naming syntax that FreeBSD's pkg utility uses internally. So far, so good. Hop on to your Raspberry Pi and change to /etc/pkg directory. If you previously configured the uzsolt repository as per my first post, open up that file and disable the repository by setting enabled: no. Alternatively you can also remove the file. Register your new repository by adding a new file at /etc/pkg/armv6.conf. Update the repository to fetch the new package list. armv6 repository update completed. 30 packages processed. Then all packages in the repository can be looked up by calling up pkg search. Remember we built shells/bash. It's about time to see if it actually worked. 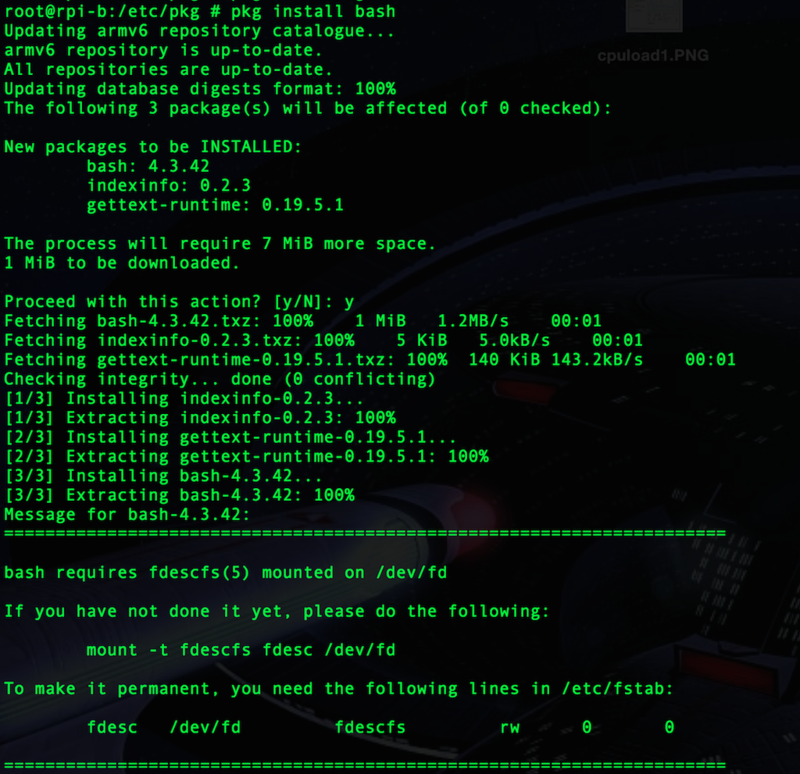 Run the bash --version command to quickly see that it really works. That's it! Now you are capable of cross-compiling packages for FreeBSD-armv6 and make them installable via a web repository the same way as on any FreeBSD tier 1 platform. My next upcoming article will the _finally_ focus on how to actually build the WiFi access point on FreeBSD.